Over the last few decades there has been a shift across many industries to use water-based, green technology over traditional solvents for a variety of applications. As a result, the need for wastewater recycling equipment has grown exponentially. Without the implementation of wastewater recycling into your production processes, wastewater will be a difficult waste stream to manage. This is because water takes up a lot of space, and regulations make it complicated to dispose of in an environmentally friendly manner. However, if you generate contaminated wastewater, grey water, rinse water or mop water in your production facility then recycling can help your company lower its costs, save money, reduce liability and market itself as an environmentally-friendly business. The Aquamizer F is a flocculation based water treatment machine using a chemical process to bind contaminants together to be filtered out. Many wastewater stream types can use a flocculation based treatment. 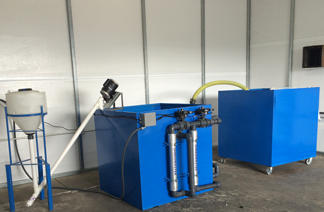 The Aquamizer M is a membrane-based water treatment machine. Membranes of various sizes can be used to filter out all contaminants from water. Each system can be custom designed based on your specific waste stream and volumes. Maratek WEH models are wastewater purification units designed to recycle contaminated water from production processes. The WEH models use a heat pump for minimum energy consumption - average of 180 to 200 watts per litre of purified water. All units are equipped with an automatic fill system. Roto-Disc systems can filter liquid waste streams consisting of water, solvents (or other contaminants) that require removal of suspended particles up to a size of 20 microns. Roto-Disc filtration systems are self-regenerating liquid filters that may be operated continuously. They are fully automatic, simple to integrate and do not have filtration elements that need to be replaced. Roto-Disc systems can be used for various applications such as cooling towers, distillation plants, bearing and machinery cooling, river water and industrial raw water filtering, as a replacement for sand filters, and in industries such as agriculture. Many techniques are available in order to recycle, re-use and minimize wastewater generated from production. Units are tailored to meet your requirements and integrate as seamlessly as possible into your production process. Maratek has worked with many companies who generate wastewater contaminated with oils, solvents, lube-oils, grease, inks, coolants, glycols and much more, where jurisdictions prohibit the discharging of wastewater to the sewer. We provide free quotes and lab tests of your wastewater stream to provide you with the best solution possible. We also have rental programs on all our equipment which allow you to start saving money immediately with no fixed costs or contract required. Want to learn more and receive one of our free no obligation quotes? Contact us today.